Las Vegas, NV – IBM Information on Demand Conference, Booth #421 – November 5, 2013 – Zaloni, a leading provider of peerless Hadoop software and services solutions, announced a new solution that will simplify the use of Hadoop for creating next generation data management solutions, or Enterprise Data Hubs. Through the signing of a OEM partnership agreement with IBM, Zaloni’s data management platform Bedrock will now be offered together with IBM InfoSphere BigInsights to deliver a first-of-its-kind comprehensive data management platform for Hadoop. 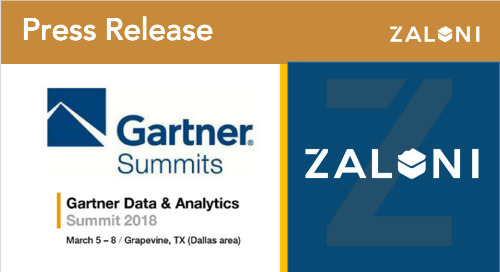 Zaloni has partnered with IBM to help drive Big Data analysis closer to business decisions for customers. For example, customers can now store all data, structured and unstructured, easily integrate both new technologies and legacy systems, optimize data management architectures, and realize rapid time to insights. Both the new Bedrock basic and enterprise editions provide benefits of an end-to-end Data Management Platform for building and deploying Enterprise Data Hubs. Bedrock with IBM BigInsights extends the solution by incorporating an enterprise-class Hadoop platform for the collection, organization and analysis of Big Data. In the coming months, Zaloni will continue to broaden its solution, specifically focusing on the Big Data needs within specific verticals, beginning with Telecom Analytics. The company will continue to leverage client feedback and exercise industry expertise to deliver peerless Hadoop solutions. Initially the companies will release two versions of the product, which will be available worldwide. Bedrock Basic powered by IBM BigInsights – Data Management platform with IBM BigInsights standard version with Bedrock standard support. Bedrock Enterprise powered by IBM BigInsights – Providing the complete Data Management Platform with IBM BigInsights Enterprise Edition with Bedrock Enterprise Support. Both the Basic and Enterprise versions of the product are available immediately. Please visit Zaloni at the IBM IOD Conference at booth #421 to learn more about Bedrock, the Bedrock BigInsights solution, and to learn more about the work Zaloni is doing with large Fortune 100 customers in Telecom, Healthcare and Financial Services verticals.